Coalmine's Rotomite-6000 dredges sludge from run off ponds. SRS Crisafulli. Centennial Coal's Mannering Colliery mine averages over 1M tons of coal per year when operating at full capacity. The mine's run-off ponds' sludge issues prompted Centennial to contact Dredging Solutions, SRS Crisafulli's Dealer in Australasia, and an experienced dredging contractor. Dredging solutions deployed the Crisafulli Rotomite 6000 auger suction dredge system because of the equipment's ability to handle difficult projects at a competitive rate. 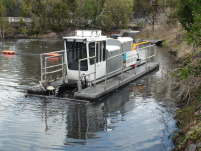 Using their self-propelled manned Crisafulli Rotomite 6000 dredge system, Dredging Solutions successfully dredged three of Mannering Colliery's surface run-off ponds. The pond slurry was pumped at an average of 200m3 per hour through a purpose-built polymer dosing system into several large bunded Geotube® dewatering containers (18m x 22.5m long). The clear water was enabled to fall back into the ponds, while the coal fine solids were captured to dry and be excavated for reprocessing.